It happens to all of us, despite our best intentions: sometimes, you cannot bring yourself to finish that book. You know which one I’m talking aboutthe one that’s been sitting on your desk or nightstand or coffee table for months, a bookmark protruding from its pages. You mean to do it. You just… can’t. Over at The Millions, Sonya Chung has a great essay about the books she hasn’t finishedand why. My commitment to finishing books in the past was probably related to the above – fear of ensuing guilt and shame. Failure, too, I suppose. And perhaps at this point in my reading life, I’ve finished (and more than that, really ingested into my mind and emotions) enough books so that I feel a little freer in exercising the right to choose how to invest my reading time and energy; to veer from the Canonical Path – if such a thing actually exists anymore – and forge my own highly specific map of literary experience and influence. I’m not getting any younger, after all. Fifteen hours – the average it takes to read a book (and I tend to be on the slow side of this average) – is an increasingly precious chunk of time. Chung breaks her unfinished books into categories, from “Books I Did Not Finish But Very Much Want to Try Again” to “Books Written By Friends/Acquaintances That I May Have Been Destined Not to Like in the First Place, But Gave Them a Try For Friendship’s Sake.” Read her full post, then tell us: how do you cope with your book-breakups? 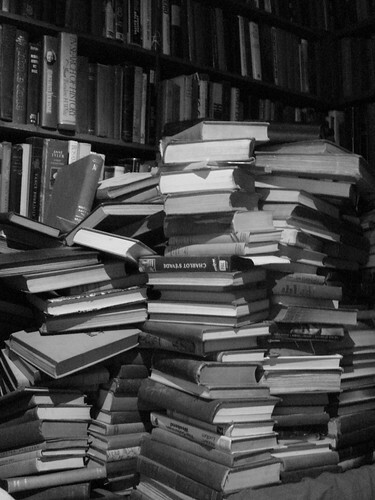 Will Anyone Miss 1.2 Million Books?